Tri-State Community Health Center offers a wide variety of specialists for which our patient population may take advantage. We make every attempt to find the coordinating specialist with each patient whom fits their specific needs and wants. We take every issue into consideration when scheduling our patients for their referral appointments, including insurance, non-insured, travel and availability. We ensure that patients keep their appointments and Tri-State receives their test results in a timely manner by using an automated system of tracking. 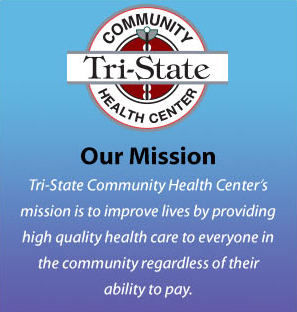 To better meet our patients’ needs, Tri-State has five community health centers in the area. We believe that everyone should have access to quality healthcare. Please call one of our Centers for additional information. For your convenience, we offer extended hours at most of our locations to include evening appointments.